10 Men Perform A Cappella Cover of ‘The Lion Sleeps Tonight’ and You’ve Got to Hear It! Music is the universal language of humankind that allows people to stay together no matter what and express their thoughts and feelings with the help of extraordinary sounds. The arrangement you are going to see below is another confirmation of this. The guys from the a cappella group are doing their best to stand out among the others. 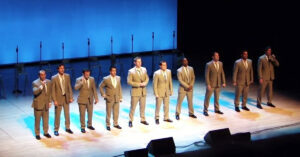 You will soon find out more about the band, calling themselves Straight No Chaser. They have been performing since the 1990s and are now considered to be one of the most well-known vocal bands across the country. They became popular due to the video that was released in 1998. Since then, everyone knew that you have to call these guys if you wish to witness the performance that is equally professional and hilarious. There is no way you can miss their version of “The Lion Sleeps Tonight”. The show was done in order to appeal to the fans of different backgrounds, and it is loved by adults and children alike. The group does not only rely on the power of their vocals but also decides to display the highest class of stage presence by doing the exaggerated moves that resemble the style of the song. The audience bursts with applause and becomes rabid with joy the second they see the singers leaving it all out on the scene and making the arrangement inexplicably funny. They have been practicing for weeks, and now, it is time to treat the viewers to the unusual a cappella arrangement that is destined to win your heart. Whenever you decide that you need a good laugh from the performers who know how to make the crowd go insane, you can press play and immerse in the world that was created by Straight No Chaser. They are maintaining the mark of quality since 1998, and now, it is time for us to discover what they are truly capable of. You won’t be able to forget the impression these guys are making on the audience. They mesmerize us with the sound and do not forget about the power of humorous additions. This is definitely a show to behold, and you will be cracking up the second you witness the vocalists that are not afraid to show what they’ve got!